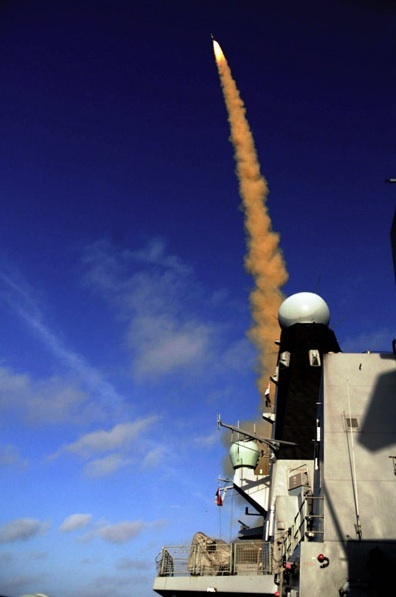 Analysis HMS Daring, first of the £1.1bn+ Type 45 destroyers now coming into service with the Royal Navy, has finally fired her primary (and only significant) armament, the Sea Viper missile system. The glad news comes five years after the ship was launched, three years after she was accepted into the Royal Navy and well into the tenure of her third commanding officer. Captain Guy Robinson, in a tinned quote supplied earlier this week by the Ministry of Defence, said: "This Sea Viper firing is a significant milestone for us and the final piece in the jigsaw as we prepare for our first deployment. I am very pleased." It was hoped that Sea Viper would be ready for use by 2007, allowing it to be fitted to HMS Daring in a timely fashion so that she would be operational in 2008. Sadly the project suffered the traditional cost and time overruns, leading the MPs of the Public Accounts Committee to dub the weapon "disgraceful" in 2009, and as a result three captains and several generations of crew have served aboard an almost completely unarmed ship* for the last few years. Sea Viper is the Royal Navy's name for the Principal Anti Air Missile System (PAAMS), a fusion of British, French, Italian and US-made equipment. It is touted as being superior to any other maritime air-defence system in the world, with the makers claiming that it can shoot down a cricket ball travelling at Mach 3 up to 75 miles away. Sea Viper's French-made Aster missiles can probably reach out to 75 miles, but the inescapable curvature of the Earth means that the Sampson masthead fire control radar can't lock on to a low-flying target until it is within 20 miles or so. Various modern and indeed not-so-modern anti-shipping missiles (eg the "Klub", "Sunburn" and "Brahmos") are both low-flying and supersonic. Then there are some serious gaps in the Sea Viper's (and thus the Type 45s') capabilities. The system cannot attack surface targets, meaning that the Royal Navy's new and cripplingly expensive destroyers will be almost powerless against properly-equipped warships or even quite minor gunboats and the like. Sea Viper is also, realistically, never going to be capable of shooting down ballistic missile warheads soaring above the atmosphere as the Aegis/Standard system used by various US and allied-nation warships can (indeed Aegis/Standard can actually shoot down satellites in some circumstances). Given that we could have had bigger, better, properly-armed Aegis/Standard ships - built in our own yards if we wanted - for roughly half the price we're paying for Type 45s, it's hard to see why Captain Robinson seems so pleased today. He could have been in command of a proper, arse-kicking warship: instead he's getting a poor second best. *Apart from Sea Viper, the only armament possessed by a Type 45 is a single 4.5-inch "Kryten" gun turret, primarily useful for bombarding targets ashore (within a few miles of deep water) and two light 30mm cannon for close-in work against pirate dhows or the like. This is weaponry of barely more than gunboat punch and of pre-WWII technology. There were plans to fit the ships with "Phalanx" radar controlled close-in defence guns and perhaps with Tomahawk cruise missiles of the sort lately used so effectively against Libya, but these were cut for cost reasons (though some vessels may be fitted with borrowed Phalanxes temporarily at times). In most situations the most useful capabilities of a Type 45 would reside in her embarked helicopter and possible party of Royal Marines.